This is the first in a series of posts on how to build a Data Science Portfolio. You can find links to the other posts in this series at the bottom of the post. A story in the data science context is a narrative around what you found, how you found it, and what it means. An example might be the discovery that your company’s revenue has dropped 20% in the last year. It’s not enough to just state that fact — you’ll have to communicate why revenue dropped, and how to potentially fix it. The first step in creating a project is to decide on your topic. You want the topic to be something you’re interested in, and are motivated to explore. It’s very obvious when people are making projects just to make them, and when people are making projects because they’re genuinely interested in exploring the data. It’s worth spending extra time on this step, so ensure that you find something you’re actually interested in. Data.gov — contains government data. 17 places to find datasets — a blog post with 17 data sources, and example datasets from each. In this case, we’ll look at the SAT scores of high schoolers, along with various demographic and other information about them. The SAT, or Scholastic Aptitude Test, is a test that high schoolers take in the US before applying to college. Colleges take the test scores into account when making admissions decisions, so it’s fairly important to do well on. The test is divided into 3 sections, each of which is scored out of 800 points. The total score is out of 2400 (although this has changed back and forth a few times, the scores in this dataset are out of 2400). High schools are often ranked by their average SAT scores, and high SAT scores are considered a sign of how good a school district is. SAT scores by school — SAT scores for each high school in New York City. School attendance — attendance information on every school in NYC. Math test results — math test results for every school in NYC. Class size — class size information for each school in NYC. AP test results — Advanced Placement exam results for each high school. Passing AP exams can get you college credit in the US. Graduation outcomes — percentage of students who graduated, and other outcome information. Demographics — demographic information for each school. School survey — surveys of parents, teachers, and students at each school. School district maps — contains information on the layout of the school districts, so that we can map them out. Schools in New York City are divided into several school district, each of which can contains dozens of schools. If we google DBN New York City Schools, we end up here, which explains that the DBN is a unique code for each school. When exploring datasets, particularly government ones, it’s often necessary to do some detective work to figure out what each column means, or even what each dataset is. The problem now is that two of the datasets, class_size, and hs_directory, don’t have a DBN field. In the hs_directory data, it’s just named dbn, so we can just rename the column, or copy it over into a new column called DBN. In the class_size data, we’ll need to try a different approach. As you can see above, it looks like the DBN is actually a combination of CSD, BOROUGH, and SCHOOL CODE. For those unfamiliar with New York City, it is composed of 5 boroughs. Each borough is an organizational unit, and is about the same size as a fairly large US City. DBN stands for District Borough Number. It looks like CSD is the District, BOROUGH is the borough, and when combined with the SCHOOL CODE, forms the DBN. There’s no systematized way to find insights like this in data, and it requires some exploration and playing around to figure out. Group the class_size dataset by DBN, and take the average of each column. Essentially, we’ll find the average class_size values for each school. Decide on a join strategy — inner or outer. Total enrollment correlates strongly with sat_score, which is surprising, because you’d think smaller schools, which focused more on the student, would have higher scores. Before we dive into exploring the data, we’ll want to set the context, both for ourselves, and anyone else that reads our analysis. One good way to do this is with exploratory charts or maps. In this case, we’ll map out the positions of the schools, which will help readers understand the problem we’re exploring. Now that we’ve set the context by plotting out where the schools are, and SAT score by district, people viewing our analysis have a better idea of the context behind the dataset. Now that we’ve set the stage, we can move into exploring the angles we identified earlier, when we were finding correlations. The first angle to explore is the relationship between the number of students enrolled in a school and SAT score. Some searching on Google shows that most of these schools are for students who are learning English, and are low enrollment as a result. This exploration showed us that it’s not total enrollment that’s correlated to SAT score — it’s whether or not students in the school are learning English as a second language or not. So far, we’ve looked at demographic angles. One angle that we have the data to look at is the relationship between more students taking Advanced Placement exams and higher SAT scores. It makes sense that they would be correlated, since students who are high academic achievers tend to do better on the SAT. 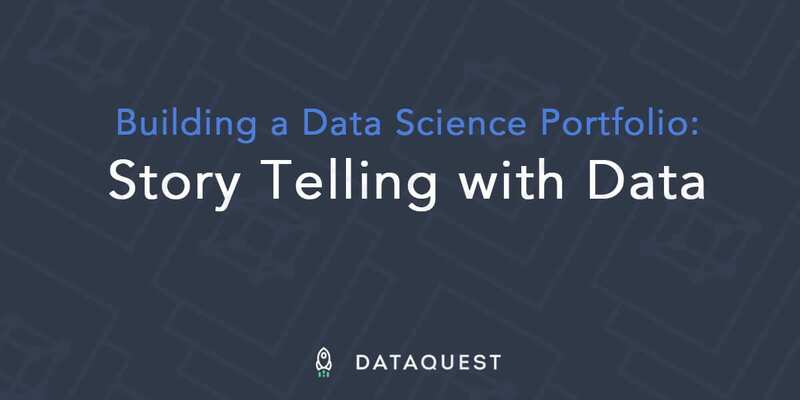 With data science, the story is never truly finished. By releasing analysis to others, you enable them to extend and shape your analysis in whatever direction interests them. For example, in this post, there are quite a few angles that we explored inmcompletely, and could have dived into more. One of the best ways to get started with telling stories using data is to try to extend or replicate the analysis someone else has done. If you decide to take this route, you’re welcome to extend the analysis in this post and see what you can find. If you do this, make sure to let me know so I can take a look. 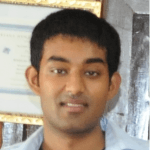 If you’ve made it this far, you hopefully have a good understanding of how to tell a story with data, and how to build your first data science portfolio piece.